Kenya Airways has received the Last Point of Departure (LPD) confirmation affirming that Jomo Kenyatta International Airport JKIA meets the Transport Security Administration (TSA) security standards. 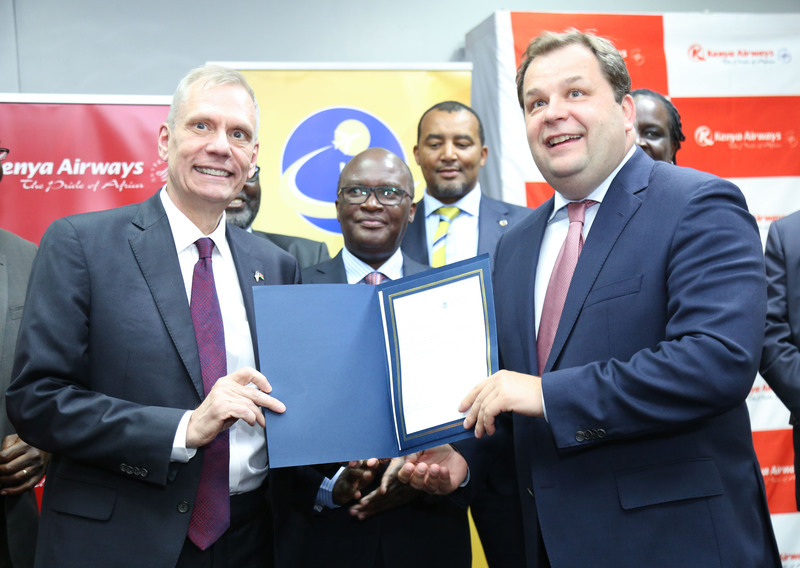 The US Ambassador, Robert Godec presented this letter to Kenya Airways Group Managing Director and CEO, Sebastian Mikosz at a ceremony held at the Pride Centre,Embakasi. “I’m very pleased today to provide U.S. approval for Kenya Airways direct flights between Nairobi and New York. These flights will connect our people. They will make travel easier for tourists, business people, students and everyone. We have worked hard side by side to make this possible.” said Ambassador Godec. The Cabinet Secretary for Transport, Infrastructure, Housing and Urban Development, James Macharia witnessed the handing over of TSA’s Last Point of Departure security standards letter. This letter enables Kenya Airways to operate direct flights to the United States of America. “We are indeed delighted that JKIA has been granted the Last Point of Departure status. This will now permit us to fly daily non-stop flights to John F. Kennedy International Airport (JFK) New York as scheduled on October 28, 2018,” Kenya Airways Group Managing Director and CEO Sebastian Mikosz said. He said the decision and confidence bestowed on Kenya by the US departments of transport and security was a major milestone to the growth and development of aviation industry in Kenya and the world. Speaking during the handover ceremony, the Cabinet Secretary for Transport, Infrastructure, Housing and Urban Development James Macharia said: “Kenya Airways flying direct non-stop flights from the Jomo Kenyatta International Airport to the US, marks a major milestone to the aviation industry in Kenya. Going forward, it will make our country an attractive destination and open up fresh opportunities for investment, trade and tourism,” said Macharia. From this new route, East Africa’s largest economy and the region stand to benefit not only in tourism, but to the overall sustainable development of the continent. Next articleThe Hub Karen invests at least sh1 Billion in an environmental conservation program.